حصلت الجامعة على 81 جائزة نوبل، وذلك أكثر من أية جامعة أخرى في العالم. خرجت الجامعة بعضاً من أهم العلماء في القرون الماضية من بينهم: إسحق نيوتن (نظرية الجاذبية)، تشارلز داروين (نظرية التطور)، ويليام هارفي، پول ديراك، جوزيف طومسون (مكتشف الإلكترون)، إرنست رذرفورد، جيمز ماكسويل، جيمز واطسون وفرانسيز كريك (تركيب الـ DNA)، آلان تورينگ، وغيرهم. View over Trinity College, Gonville and Caius, Trinity Hall and Clare College towards King’s College Chapel, seen from St John’s College chapel. On the left, just in front of Kings College chapel, is the University Senate House. Cambridge University has over the course of its history built up a sizeable number of alumni who are notable in their fields, both academic, and in the wider world. Officially, affiliates of Cambridge University have won a total of 84 Nobel Prizes, more than any other university according to some counts, as well as eight Fields Medals. 15 رئيس وزراء بريطاني، منهم روبرت والپول (أول رئيس وزراء لبريطانيا العظمى). الملكة مارگرته الثانية من الدنمارك. 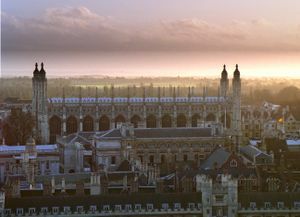 ^ "University of Cambridge appoints Chief Investment Officer". University of Cambridge. 2006-11-27. Retrieved 2008-09-08. ^ "Facts and Figures January 2008" (PDF). University of Cambridge. Retrieved 2008-06-01. ^ أ ب ت "Table 0b - All students FTE by institution and level of study 2004/05" (Microsoft Excel spreadsheet). Higher Education Statistics Agency. Retrieved 2008-06-01. ^ "Identity Guidelines - Colour" (PDF). University of Cambridge Office of External Affairs and Communications. Retrieved 2008-03-28. ^ أ ب "QS World University Rankings 2011/12". Quacquarelli Symonds. Retrieved 16 September 2011. ^ أ ب "Top European Universities 2011". Times Higher Education. Retrieved 7 October 2011. خطأ استشهاد: وسم <ref> غير صالح؛ الاسم "THE World University Rankings 2011" معرف أكثر من مرة بمحتويات مختلفة. ^ "University League Table 2012". The Complete University Guide. Retrieved 16 September 2011. ^ "University guide 2012: University league table". The Guardian. 17 May 2011. Retrieved 16 September 2011. "Japanese Students at Cambridge University in the Meiji Era, 1868–1912: Pioneers for the Modernization of Japan". Retrieved 2009-08-08. , by Noboru Koyama, translated by Ian Ruxton, "A Translation from a Japanese Original". Lulu Press. 2004. Text "ISBN 1-4116-1256-6" ignored (help) This book includes information about the wooden spoon and the university in the 19th century as well as the Japanese students. مشاع المعرفة فيه ميديا متعلقة بموضوع University of Cambridge.